The rotten war criminals in Washington, Tel Aviv, London, Ankara, and Riyadh want to see ISIS emerge triumphant in Damascus. Photo source. Saudi, Turkish, Israeli, American, and European support for ISIS terrorists will never end. They don't care about the political and humanitarian consequences of their pro-terrorism policies like the massive refugee crisis in Europe and periodic terrorist attacks in Western countries. In fact, they welcome these consequences because they enlarge the role of the state and engender fear and paranoia in society, giving politicians more political space to pass draconian laws. The only solution to the war in Syria and the other battlefields is total victory over ISIS and its state sponsors in the region. Anyone who argues otherwise is for genocide because the ISIS mass murderers have no time for minorities or religious heresy. Not only will Washington, Brussels, and Tel Aviv not play a role in the victory over ISIS, but they will do everything in their power to prevent it, as Israel's military leaders have even said on record. They want ISIS to survive, and outlast their competition, damning millions to the sword of the most perverse form of Islam imaginable. 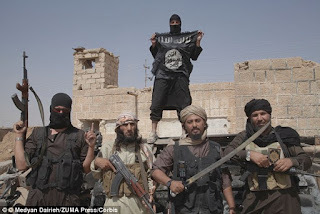 But the bloodthirsty leaders of Saudi Arabia, Qatar, Turkey, Jordan, Israel, NATO, and America are in for a rude awakening if they believe they will escape the chaos and mayhem that they have generated through their covert support for ISIS. At a certain point people everywhere will realize that defeating ISIS is impossible without changing the evil regimes of these countries whose policies and actions have directly contributed to its rise in the last half decade. The Western analysts, diplomats, journalists, and commentators who blame the growth of ISIS on Assad and Putin are either corrupt liars or braindead fools. They are more evil than ISIS because their reality-warping propaganda gives cover to ISIS, enabling the terrorist cult to remain in Syria and continue to mass murder anyone who disagrees with them. Dr Antaki reinforces that President Assad’s popularity has increased rather than waned since the US NATO war against Syria began five years ago and he deconstructs much of the propaganda upon which the US and NATO base their interventionist, neo-colonialist policies.